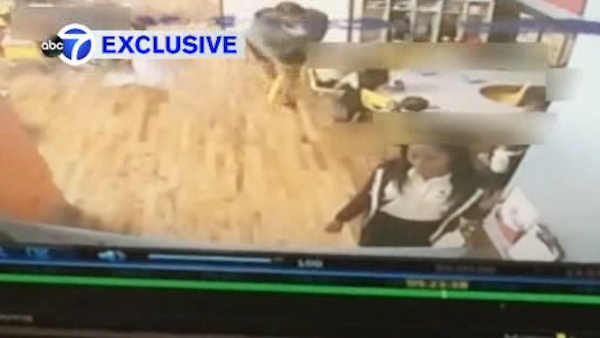 FLATBUSH, Brooklyn (WABC) -- A Brooklyn day care center has been shut down after an Eyewitness News exclusive reporting that young children were hit by a teacher with a wiffle ball bat. At least one came home with bruises on their body and the teacher is now under arrest. The New York City Health Department Tuesday issued a a Commissioner's Order for immediate closure of FVM Bethel Day Care Center, effectively immediately. The agency also suspended the infant/toddler program that operates at the site. In a statement, the Health Department said: "There is nothing more important for us than the safety of our children. Parents should trust that day care centers are safe and nurturing places for their children. This day care's permit was suspended today following a Health Department investigation. We are currently notifying families to help them find alternative high quality child care centers for their children." The city's investigation found the child care center failed to take sufficient steps to address the staff members actions and the inaction of other staff in the room, and that the center failed to take corrective actions in requiring staff to report the incident as stipulated under mandated reporter provisions in NYS State Social Service Law and the Health Code. Police have charged the day care provider with endangering the welfare of a child. Eyewitness News called and emailed to get a comment from the daycare in person, but so far there has been no response. The program will be required to submit a corrective action and safety plan for the agency's evaluation and approval before it can reopen.